Little man and I had a good time at my parent's house, and I had a great time meeting up with some friends! 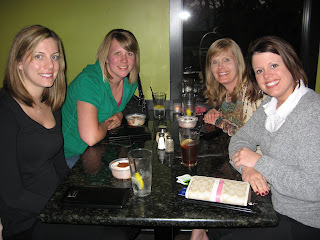 We had dinner at one of our favorite restaurants, The Brown Bottle. I had their vegetarian lasagna and it did not disappoint. See my little to-go container? Yeah, that is what excites me the most....leftovers for lunch the next day! Last night I made chicken enchiladas. This recipe came from one of my mom's friends a few years back and we've been making it ever since. It is so simple and easy and tastes even better the next day. It does contain a can of condensed soup that goes into the cream sauce, so for all of you out there that do not eat canned soups, I think it could easily be substituted with either salsa, or a homemade cheese sauce, if you are up for it. In a skillet mix shredded chicken with green chilies, onion and a handful of shredded cheddar cheese, until melted and heated through. Spray bottom of 9x13 casserole dish with cooking spray (or spread salsa on the bottom on the dish, that works too). Fill tortillas with mixture, roll and place seam side down in pan. 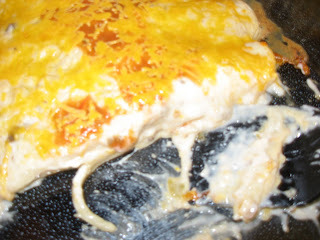 Once dish is filled, mix sour cream and soup and pour over the enchiladas. Top with salsa and more shredded cheese. Bake at 350 degrees for 30 minutes or until hot and bubbly. Serve with additional toppings of salsa, shredded lettuce, tomatoes, black olives, crushed tortilla chips, etc. Yum! This is also a great dish to take to someone who has just had a baby, is sick, moving, etc., as it freezes really well. Usually I divide this into two smaller dishes and freeze half, but last night we were HUNGRY. I LOVE the brown bottle! I had one within walking distance of my apartment when I went to U of Iowa..I miss those days! Mmm, these look good. 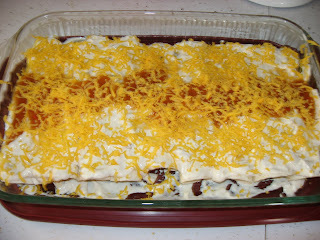 I love enchiladas! Mexican sounds great right now! Especially a nice icey margarita :). I'm so jealous....I LOVE The Brown Bottle. YUM!! I'm going to have to try your enchiladas. I can't seem to find a recipe for chicken enchiladas that I enjoy, so I'm always up for trying a new one! Hey I made something like this last night! I am going to put post up of it today!